The plastic carrier bag was invented in the 1960s, although it really came into its own a decade or so later as supermarkets gradually came to dominate our shopping habits. Since then our reliance upon it has grown exponentially. Last year, in England alone, we got through a staggering 7.6 billion plastic carrier bags, which together weigh around 61,000 tonnes. Many of these bags end up as litter, much of it non biodegradable and taking hundreds of years to decompose. Accumulations of plastic bags have been known to kill and endanger wildlife and marine animals and to cause other environmental damage, such as flooding by clogging up drainage systems. Something has to be done, and the introduction of the five pence levy on plastic carrier bags in England in October this year was a welcome, if long overdue, initiative. This new levy is a good example of the value of persistence when it comes to campaigning on issues relating to the common good. The UK government had long resisted the call for a tax on plastic carrier bag usage, finding excuse after excuse to delay its introduction. First we had a hopeless attempt at a voluntary industry code, which actually led to an increase in plastic carrier bag use. Later, when it was clear that levies introduced by the devolved governments of Northern Ireland, Scotland and Wales had achieved startling results, the UK government still resisted, arguing that it needed time to “monitor” the impact of the schemes in those devolved countries. But in the 2 months since its introduction in England, this modest levy on plastic carrier bags has already led to a remarkable turnaround in shoppers’ behaviour. Last week, the U.K.’s biggest supermarket chain Tesco reported that demand for its plastic bags in England has dropped by almost 80% since 5 October. Aside from demonstrating the importance of persistence, another key conclusion here is surely that relatively modest measures like this can have a major impact on consumer behaviour. The government’s pathetic attempts to avoid introducing the plastic carrier bag levy is reminiscent of its current reluctance to introduce a sugar tax, another common sense proposal that could change consumer behaviour for the better if only the political vision and will was there. Known as “scallion” in the United States and “green onion” in Canada, here in the UK we call it the “spring onion”, which is something of a misnomer. On my allotment plot, the Circus Garden, this is a vegetable that I plant them in two sowings, the first before the start of spring and the second at the end of the summer. In a good year this means I have a steady supply for around 8 months. In this recipe, I’ve combined spring onions with sweet potato, potato, chilli and coriander to make a colourful and flavourful version of the classic dish latke. Latkes are most closely associated with Hannukah, the week-long festival of lights, which is currently being celebrated by the Jewish community. The recipe below includes a vegan option, which uses ground flaxseed in place of eggs. When combined with water, ground flax seed is a very effective binding agent. It is also rich in Omega 3 oils and a range of important trace elements. Whichever method you use, these latkes are easy to make and they are really very good indeed. 1. For the vegan version of this recipe, put the ground flax seed in a small bowl with 60 ml water, whisk to combine and put it to one side to thicken while you prepare the other ingredients. 2. Peel and cut the potatoes and the sweet potatoes into thin matchstick size batons (alternatively, as I did, use a spiraliser for a more interesting effect). Place them in kitchen paper and press to remove excess moisture. 2. In a mixing bowl, whisk the flaxseed and water mixture (or the eggs) with the cornflour and sea salt until smooth and lump free. Add the sweet potatoes, potatoes, spring onion, chilli and chopped coriander and stir until fully combined. 4. Pour the groundnut oil into a deep pan over a medium heat. When the oil is hot, place heaped tablespoons of the mixture into the pan. You will need to cook the latkes in batches to avoid overcrowding the pan. Flip the latkes over after 2-3 minutes and remove from the pan when they are crisp and golden brown on both sides. Drain on kitchen paper. 5. Serve hot with apple sauce or a good quality chutney. My city of Canberra (Australia’s national capital) banned free plastic bags a couple of years ago. I don’t know what the figures are now, but it has created a new habit for many people. Brilliant! And I love that you use ground nut oil. My mother always used “peanut oil” in her latkes, so yours are authentic! 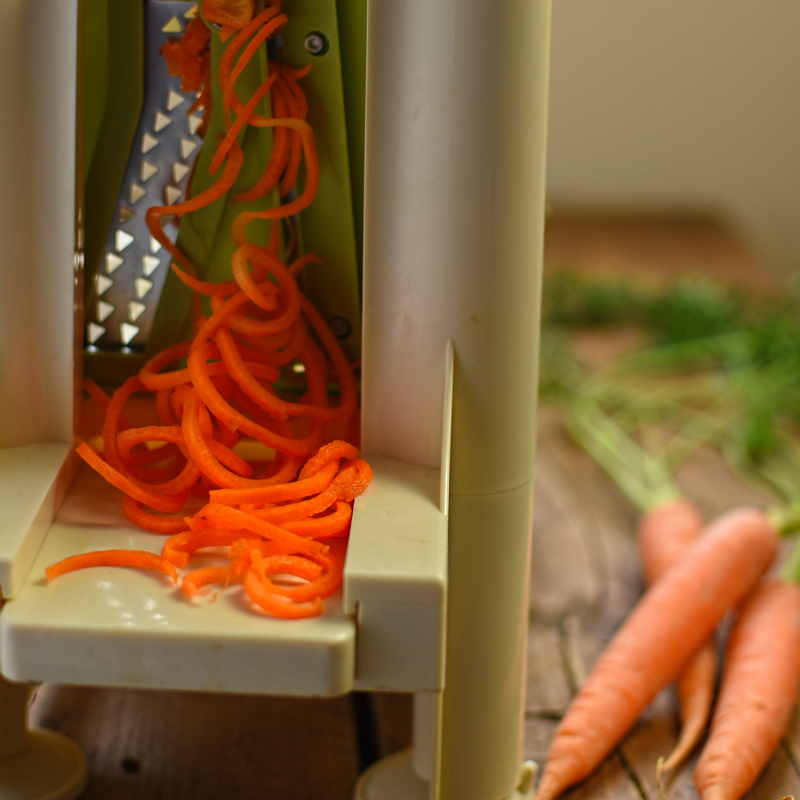 PS Do you have a spiralizer? Your latkes are beautiful. Did you mean 7.6 billion or 76 million, Steve? 7.6 million doesn’t sound quite enough to me. Blowing my own trumpet, I haven’t taken a plastic bag from my supermarket in the last 12 years. And it has always saddened me, and still does, to see the way people just take them willy nilly. If the thought of spending 5p on a bag stops the rot you’d like to think the same could apply to sugar, but I think it would have to be a lot more as it would be an ‘invisible’ tax ‘swallowed up’ in the goods purchased. Hi Malcolm. I’m indebted to you for your proofreading skills. The figure is indeed 7.6 billion (I’ve now amended the text to reflect the correct figure). You may well be right about the sugar tax, in that it may need to be pitched at a higher level to have an effect, but when our health services are creaking at the seams through conditions related to excess sugar consumption the case for penalising production and consumption of unhealthy sugar-rich food products is overwhelming. Wow these look great. I will be trying them. Do you have any sub recommendations for a non grain flour? Thank you Tabitha. In terms of non-grain flours I would be inclined to bow to your superior knowledge, but I would suggest tapioca flour would be a good substitute for cornflour here. Tried it. Didn’t have coriander but used parsley and a teaspoon of powdered coriander. Magic. These look gorgeous. The picture is wonderful.